Mac nears the crux of Surrealistic Pillar Direct. 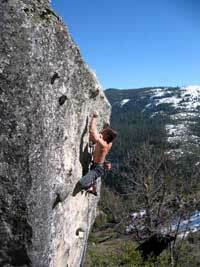 South Lake Tahoe offers exquisite year round climbing for every ability and taste. Trad climbers can jam smooth Yosemite like cracks at Sugarloaf or Eagle Lake, pull on steep knobs at Phantom Spires, lead their first multi-pitch route at Lover’s Leap. Sport climbers can clip bolts at Luther Rock, Luther Spires and Mayhem Cove. This book focuses on some of the highest quality granite in the Sierra, but unlike Yosemite’s glacier-polished rock, Tahoe granite is more textured with knobs, dikes, and edges. This makes it a little more “user friendly” and means you climb steeper routes at easier grades. In Tahoe it’s easy to change elevations and find a crag with perfect temperatures. Go to Sugarloaf if a cold snap rolls in, switch to Lover’s Leap and Phantom Spires in mild conditions, or climb at Eagle Lake Cliff and Wrights Lake Cliff to escape the heat. Good climbing weather is always at hand. You also get to choose your level of serenity. Eagle Creek Cliff and Wrights Lake Cliff have alpine lakes, craggy peaks, and silence. Lover’s Leap or 90-Foot Wall are more social destinations and right by the road. Sit around a fire at the Phantom Spires camping area or go big at the Stateline casinos. Cook ramen on your Whisperlite stove or eat Sushi in South Lake Tahoe. You get to choose. We all love Yosemite and Tuolumne, but the fact is they’re often a logistical hassle. Not so in Tahoe. No advanced planning, no reservations, no fees, and no ranger presence. You camp for free on most Forest Service land and there is always a supermarket, restaurant, or latté nearby. Unlike the National Parks, dogs are allowed at all the climbing areas (and can guard your pack from squirrels). Tahoe is the ideal training ground for Yosemite’s long routes. Rather than get bogged down in the crowds on Yosemite’s limited selection of 5.6-5.9s, build your skills on Tahoe’s more numerous moderates and then head to the Valley. If you live in the Bay Area, most Tahoe crags are closer than Yosemite. For some, Sugarloaf is even closer than Pinnacles. The myriad rock features offer many different climbing options for each crux which can help or confuse. Sometimes it is easier to do an improbable face move to the side of a major feature. Some 5.8 moves, the crux on Haystack for example feel like 5.7 if you have the perfect beta or 5.10 if you miss a key hold. Stemming, long reaches, and discriminating handhold selection are invaluable Leap skills. 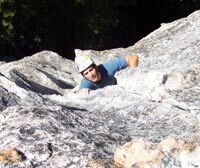 Most crack climbs involve a combination of stemming, face climbing and the occasional straight-in jam. 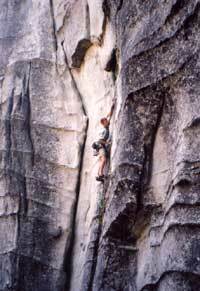 Most face climbs involve reaches and mantels between dikes. It is not the size of the holds but rather the distance between dikes that determines route difficulty. Face climbs at Lovers Leap favor tall climbers as a 5.10 move may be 5.9 for someone taller than 60 and 5.11 for someone shorter than 55. The standard Tahoe traditional climbing rack is two sets of cams, 1-2 sets of nuts, 10 quickdraws, and 6-10 slings. Many anchors are natural so having a little extra gear is nice. Each SuperTopo notes where additional gear is needed. 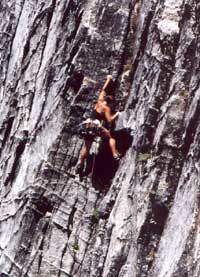 A single 60m rope suffices to descend and top rope most climbs. However, for maximum top rope options, use a 70m rope. In rare cases, two ropes are mandatory to descend. When top roping, it’s often useful to extend the anchor by 10 feet so the rope doesn’t run over an edge. For this purpose, bring 20 feet of webbing or a cordalette. Tonya Fischer boulders near the amazing Balancing Rock. 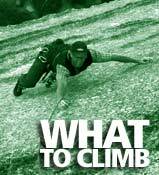 The following list will introduce you to the climbing at Lovers Leap. Other great introduction areas include Phantom Spires, 90-Foot Wall, Luther Spires and Echo Lake. All these climbs are in our South Lake Tahoe guidebook. We encourage you to check out the FREE SuperTopo of Corrugation Corner to get psyched for a Lake Tahoe adventure. This climb is great for first time Lovers Leap climbers. The route ascends 300 feet of clean, moderate, and well-protected terrain. Less sustained and less quality than Knapsack crack, this route is a great first outdoor rock climb. This is the most popular Hogsback climb. It delivers sustained and wandering 5.6 moves up the tallest part of wall. The climbing is mostly 5.4 with one short 5.6 fingers crux. This is a good step up from Knapsack Crack and definitely easier than Deception. With just a few moves of 5.7, Pop Bottle is a great introduction to the East Wall. While the route ascends lower-angle rock, a few steep bulges add some spice. While Surrealistic Pillar follows a line of large cracks, it is almost entirely a face climb. This challenging and adventurous climb meanders across features rarely found on many Lovers Leap routes: a huge belay ledge, an enormous featured corner, and super-sized dikes and flakes. Once warmed up to Leap climbing, you may want to expand your tick list to the climbs listed below. This must-do climb offers more than a few memorable face and crack moves. The name comes from the second pitch crux where, depending on your height, you must make a huge Bears Reach between two large holds. This awesome route is one of the steepest climbs in this guide and one of the steepest granite 5.7s you will find anywhere. Second to The Line, Haystack takes one of the most striking crack systems on the East Wall and ascends a diversity of terrain from straight in jamming to face moves and roofs. With only a few 5.8 moves, this is a good entry to 5.8 and is only moderately more difficult (and better protected) than Bears Reach. The Line is the most popular and striking route at Lovers Leap and offers a delicious mixture of lieback, stem, and face moves with the occasional straight-in jam. There are four reasons why you must climb this route: the amazing line, the stomach-turning exposure, the flawless rock quality, and a fascinating history. Sustained at the 5.8 and 5.9 level, Scimitar is set apart by its variety as you will encounter lieback cracks, runout face, and steep bulges. This unsung classic has somehow escaped notice for many years. The climbing is sustained, varied, and occasionally spectacular. Lake Tahoe has over 1000 documented boulder problems and more are discovered ever week. The SuperTopo Route Beta section has some of the best Lake Tahoe bouldering Areas. Be sure to check out our free Bouldering Download from the SuperTopo Lake Tahoe Bouldering ebook, you can also get a free download of the Purgatory Bouldering Area north of Reno. 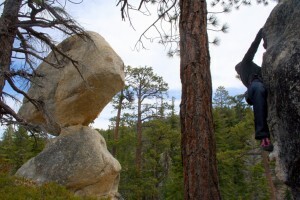 Also check out SuperTopo Northern Califronia Bouldering for more problems around Lake Tahoe and much more. All the climbing areas in South Lake Tahoe are on National Forest land and are so far subject to few restrictions. Lets keep it that way. Use existing trails, clean up your campsite, and park only in the Lover's Leap campground or along Highway 50. Mitch Underhill at Phantom Spires. A car is essential in Tahoe as public transportation is scarce. From San Francisco, drive Interstate 80 to Sacramento and join Highway 50. 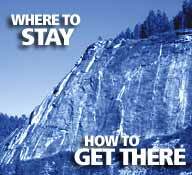 Access all climbing areas in this guide off Highway 50 or Highway 89. Be aware that many people get speeding tickets 10 miles east of Placerville. Book a flight to Reno/Tahoe Airport (1.5 hour drive to South Lake Tahoe) or Sacramento International Airport (2 hours drive to South Lake Tahoe). Rent a car at the airport. You can also fly into Oakland or San Francisco, rent a car, stay the night in a hotel, then drive about three hours. South Lake Tahoe has year round climbing depending on the elevation but most areas are best from April to November. Below is a summary of the climbing seasons. Note that the beginning and end of the climbing season is decided by fierceness of the winter. In lean years, you can climb year round as most locations. In heavy years, you are much more limited between December and April. 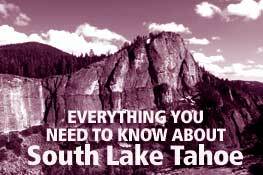 See current South Lake Tahoe Climbing conditions. MayJune: This is a prime time to visit South Lake Tahoe because of the long days and great climbing temperatures in the 60s and 70s. Depending on the snow year, the walls are generally clear of snow and dry by the end of April. Be prepared for some wet cracks and the occasional late-season storms. Expect crowds. JulyAugust: While the skies are usually clear, the day temperatures are consistently in the 80s and 90s making it often uncomfortable to climb in the sun. Seek out the shade and climb in the higher elevation areas like Eagle Lake Cliff, Wrights Lake. Most Lover's Leap crags are perfect in the morning. SeptemberOctober: Fall is a great time to visit South Lake Tahoe. Temperatures are perfect for climbing and generally stay in the 60s and 70s. There are rarely any storms and the rock is dry. In early September, the occasional heat wave can roll through and in late October the temperatures can be freezing at night. Expect crowds. November: The weather is uncertain during this time. The first winter storm usually hits in the first two weeks of November which makes most of the routes too wet to climb for the rest of the winter. However, during a dry year the climbing conditions can be great with temperatures in the 50s and 60s with few crowds. Even during a dry November, you will need to bring warm clothing as night temperatures are often below freezing. DecemberMarch: In a mild winter, you can climb at any south-facing crags. In a normal or heavy winter, climb at elevations below 5000' like Woodfords Canyon or Sugarloaf. Snow covers the base and summits of most cliffs, temperatures are often freezing and the rock is wet. During cold years ice forms on the right side of the East Wall at Lover's Leap making for the rare California multi-pitch ice climb. There are usually a few weeks where you can ice climb up Eagle Creek Canyon. In the winter you can also boulder at the Pie Shop. April: Wet rock and unstable weather usually make April a terrible time to climb at South Lake Tahoe. However, in an extremely dry year April can have great weather and be free of crowds. South Lake Tahoe weatherfive day forecast for the closest town to South Lake Tahoe. Twin Bridges weatherfive day forecast for the closest town to South Lake Tahoe. Sarah leads up Psychedelic Tree. The Strawberry Lodge, located on Highway 50 just a five-minute walk from Lover's Leap campground, offers American food and has a bar. The bar serves great local and semi-local brews and is the spot of choice to talk about all the climbs you onsighted that day, how you found all the ratings too easy, and how that 5.12 you climbed next to looked pretty doable. Healthy Breakfast/Lunch: Sprouts, 3123 Harrison Avenue, (530) 541-6969. You can read other South Lake Tahoe Food Recommendations on the forum. You will find more detailed camping info in the introduction to each specific climbing area in South Lake Tahoe Climbing. Most climbers, no matter where they climb, camp at Lover’s Leap for $10 per site per night ($5 per additional car) or free at Phantom Spires. Other options include the Forest Service land off Strawberry Tract Rd, just southwest of Lover's Leap. If you and some friends want to pitch in, consider renting a Lake Tahoe Vacation Home Rental from Chris McNamara. If you have 4 or more people, it is probably less expensive than a cheap motel. And it comes with a full kitchen and climbing books and magazines! Raley’s, located at the junction of 89 and 50 in South Lake Tahoe, offers the best prices and selection. Liras (2977 Highway 50; 530-577-5399) located in Meyers, has a smaller selection. If you’re staying at Lover’s Leap, Strawberry Market, located across from Strawberry Lodge, has a got you covered for all the essentials. If driving from the Bay Area, there are major grocery stores next to the freeway in Placerville and Pollack Pines. Lover's Leap Guides (530-318-2939) is a guide service run by some of the most experienced Lover's Leap climbers. They offer classes in beginning to advanced climbing, learning to lead, summiting all the Phantom Spires and adaptive climbing. Alpine Skills International and Sierra Mountain Guides also offer group trips and private guiding to climbs at Lover's Leap and the rest of the Tahoe area. Mountain Adventure Seminars (209) 753-6556) guides at Lover's Leap, Calaveras Dome and through northern California. The closest selection of gear and climbing beta is at Sports Ltd. (4008 Lake Tahoe Blvd. South Lake Tahoe, CA. 96150 • 530.542.4000). When you need a rest day or just want to mix things up, head to South Lake Tahoe for two world-class mountain bike trails: The Flume Trail and Mister Toads Wild Ride. During the summer you can also buy lift tickets and ride at many of the ski resorts. There are also a number of hiking trails not to mention all the Lake Tahoe activities: kayaking, water skiing, sitting on the beach, etc. All the nightlife is at either one of South Lake Tahoe’s two major casinos: Harrah’s or Harvey’s or Montbleu.